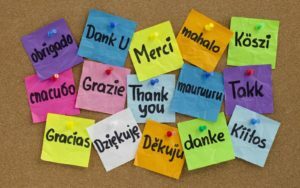 “Gracias”, “Merci”, “Danke” all mean the same thing, “thanks.” Giving thanks or expressing gratitude upon receiving something is taught to us from an early age. As children, our parents and others around us insisted that we learnt the art of saying “thank you.” These are common courtesies found in every culture. But why is it important to express gratitude or say thank you and how will expressing gratitude fuel your success? Why should you become a grateful person? May these three reasons and three ways (gratitude boosters) answer these questions and accelerate your progress in 2017. And you will be singing as the days go by. 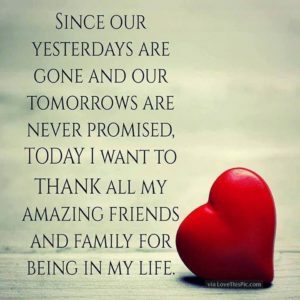 I have often found that when I am feeling discouraged, once I begin to express gratitude for what I have instead of focusing on what I don’t have, I immediately begin to feel better even if my situation does not change. When we practise to give thanks for what we have we are counting our blessings. When we are discouraged, we often have a lopsided view of things. However, by pausing to give thanks, I believe things begin to gain their proper place. The story is told of a man sitting in a tree, contemplating ending his life and lamenting the hardships he faced, and the fact that he had only one banana left to eat. After eating, the banana the skin fell to the ground and when the man looked down, lo and behold, he saw a beggar who picked up the banana skin (peel) and began eating it. Immediately the man became thankful, realizing that his situation may not be as bad as he thought. There is another story of a man who was lamenting the fact that he was tired of walking and wished he had a car, only to see someone in a wheel chair, who had no legs. It is important that while we strive for more that we remember some of the things we take for granted lest we become discouraged. As we strive for success, let’s practice being thankful and seeing things in their proper perspective. Thanksgiving is reserved for receivers. If you want to continue receiving, be thankful. The one who expresses thanks from the heart is more likely to receive again. When thanksgiving is expressed, it floods the giver with feelings of warmth and appreciation. Expressing thanks honours the giver and encourages the giver to continue being open- handed or generous. Have you ever given a gift to someone who did not appreciate it or pause to say thank you? Often times when “thanks” is not forth coming, we are left to wonder if the gift was ever received, and if the gift was received, is it that the receiver did not like it? The feeling is even worse if you spent a great deal of effort or expense in acquiring the gift. When gratitude is not expressed, you are less likely to give to that individual again. A Gratitude Journal: Keep a journal of 1-5 things you are grateful for each day. Review the notes quarterly, half yearly or at the end of the year or when feeling discouraged. It’s amazing to look back at the things which have been accomplished in my gratitude journal. A Gratitude Jar: Get a Mason jar or any jar and put gratitude notes in the jar each week or each day. Review the notes quarterly, half yearly or at the end of the year or when feeling discouraged. Vocalize Gratitude: You can express gratitude audibly to someone else or to one’s self. Let others know you are grateful for them and what they have done for you. Express gratitude in your quiet time or in your prayer time to God. 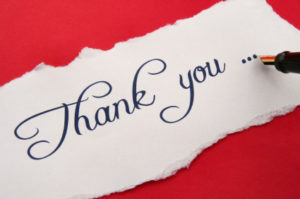 Express gratitude before going to bed or after rising each morning. As you engage in the Success Habits Challenge for 2017, excel in the expression of gratitude. If you arrived home safe today, be thankful –be thankful you were not in an accident today. If you are in good health or have a bed to sleep on, express thanks –be thankful. Be thankful you have a job or ate a meal today. Many people are homeless, jobless and hungry. Give thanks for your technological gadgets; give thanks for friends, family etc. We should express gratitude to the people around us for their kindness. Sometimes we can even thank our enemies because their attacks or criticisms may have fuelled our successes by pushing us to prove them wrong. In any case, I want to challenge you to call a friend or family member, a co-worker, a teacher or anyone who has helped you in anyway and express gratitude this week. You may choose to send a text message or write a letter send an email, a postcard or even send a gift with a note of thanksgiving. However you choose to, write down the names of 1-5 persons this week and express gratitude to them. I want to encourage you to continue the 2017 Success Habits Challenge to practice five habits of which one of them is Expressing Gratitude on a daily basis. What are some of the methods and benefits of Expressing Gratitude that you have discovered or developed? Do share them with us. If you have been doing the Success Habits Challenge for 2017, how has it been going? What results have you been seeing thus far? Has your progress been accelerated? Has this information been helpful? Feel free to share this article with your friends on social media (instagram, facebook, twitter etc) and comment on the blog. Share it using the social media buttons at the top and bottom of this article and let’s equip more people to win at life! Let’s score big in 2017! 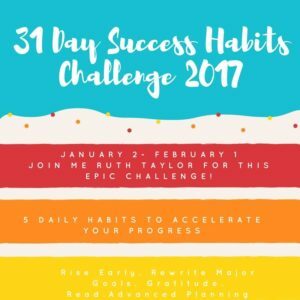 This entry was tagged 2017 Success habits challenge, gratitude, health, success. Bookmark the permalink.